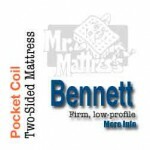 Bennett Pocket Coil Mattress | Mr. Mattress is Vancouver's Mattress Store (Since 1964). Plenty More Two-Sided Mattresses in Store. Mr. Mattress is Vancouver's Mattress Store (Since 1964). Home of the Two-Sided Mattress! Locally Made Mattresses. We Deliver. (604) 255-2113. The Bennett is our foam encased pocket coil mattress, at our starting price, in our firm mattress line up with 1020 foam encased, 6″ pocket coil compressed into a 5″ pocket giving it a little more firmness along with a 1/2″ of 2/95 which is again on both sides (two-sided). It’s firm and durable. Provides limited motion transfer. To get an awesome quality, foam encased pocket coil mattress for not crazy doe, this is the mattress for you. If it’s good enough for the boss’s wife, it’s good enough for you. (Seriously, we have this bed at home.) If, the comfort level is to your preference. The Bennett pocket coil mattress is popular for boats, RVs and campers because of it’s low-profile, at about 8 1/2 inches thick. The Bennett works well with modern bedroom furniture; you can see more of your headboard because of it’s low-profile. If you need this mattress for your RV or made Asian size (approximately 59″ W x 74.5″ L), good news! It’s the same price as a queen size mattress, but we would have to order it in for you. You get it in 5 – 7 business days. Start With Trust®. Read Our BBB A+ Review. Ready to Replace that No Flip Mattress? Call (604) 255-2113. We deliver to Vancouver, North Vancouver, West Vancouver, Richmond, Burnaby, New Westminster, Cloverdale, Surrey, Langley, Delta, White Rock, Maple Ridge, Pitt Meadows, Port Coquitlam, Coquitlam, Port Moody, Belcarra and Anmore. Living outside these burbs? Give us a call.